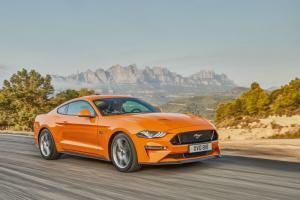 The new 2018 Ford Mustang for Europe has been officially unveiled today. 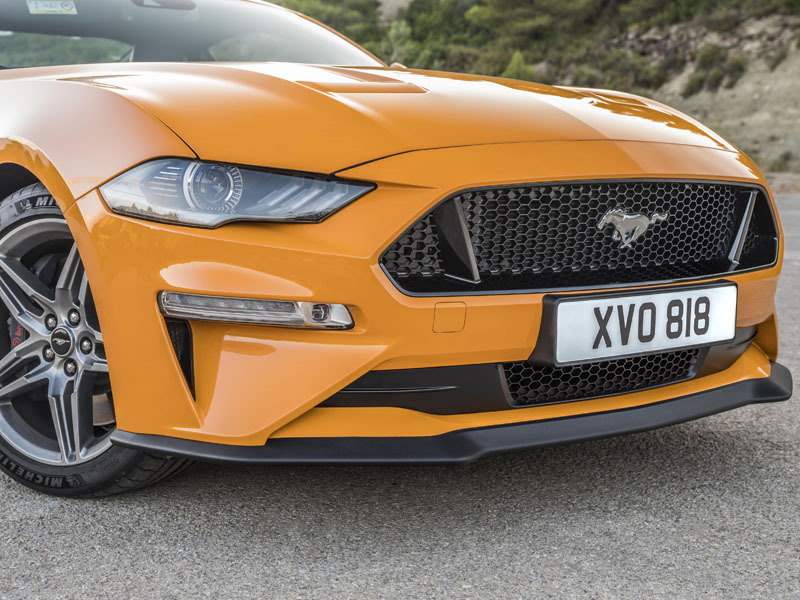 The most obvious change is to the design of the front end, with a more aggressive bonnet line and grille, aimed at improving aerodynamics. 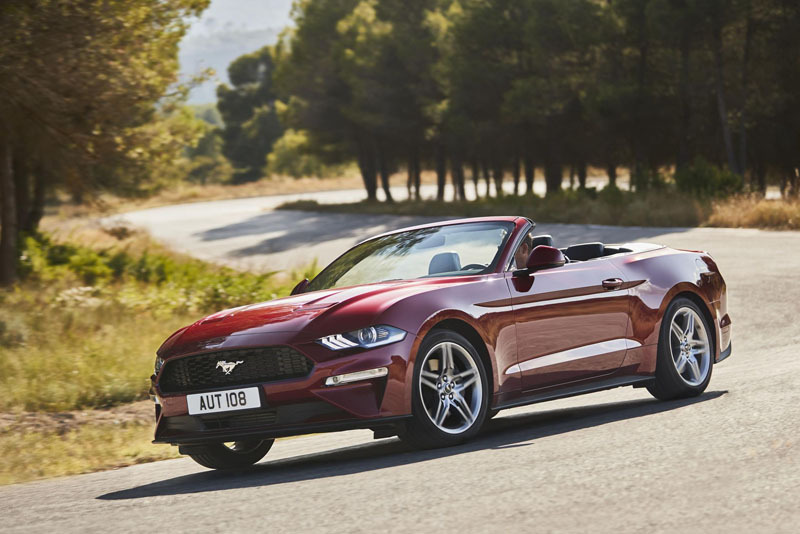 The Mustang now features LED headlights, tail-lights and turn signals, including the distinctive tri-bar running lights that were previously disabled on European models. Three new colours have been added – Kona Blue, Orange Fury and Royal Crimson – plus three finishes of 19-inch alloy wheel – Nickel, Ebony Black and Polished Aluminium. Interior quality is said to have received a lift with soft-touch materials on the doors and real aluminium for the door handles. Heated and cooled leather seats – plus a heated steering wheel – are offered across the range, while optional leather Recaro racing seats are also available. 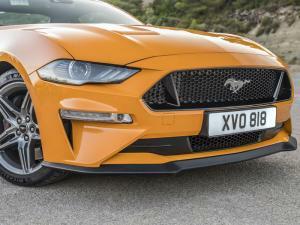 A new 12-inch digital instrument cluster alters its layout based on driving mode, and offers a range of customisation options including colour schemes. Ford’s Sync 3 infotainment system provides media and navigation functions. 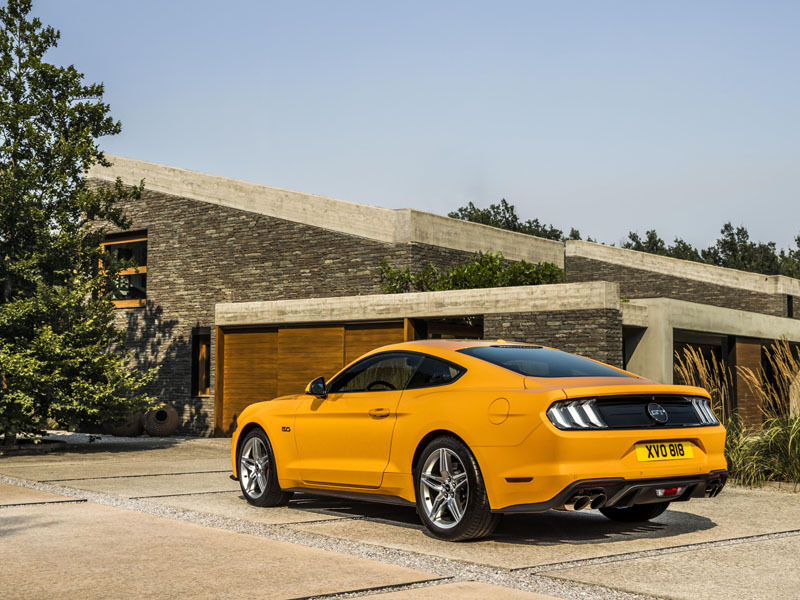 The familiar 5.0-litre V8 now revs higher, while a new high-pressure direct injection system helps the engine to develop peak power of 450ps. The four-cylinder 2.3-litre EcoBoost now delivers 290ps – down from 317ps – but gains a new transient overboost function. 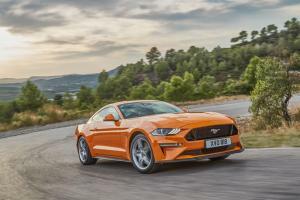 The six-speed manual transmission has been beefed up to cope with V8’s increased power, together with a new twin-disc clutch and dual-mass flywheel. 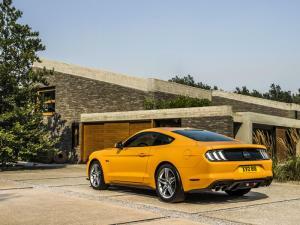 Both are available with a new 10-speed automatic transmission that’s said to make the new car the fastest-accelerating Mustang ever. 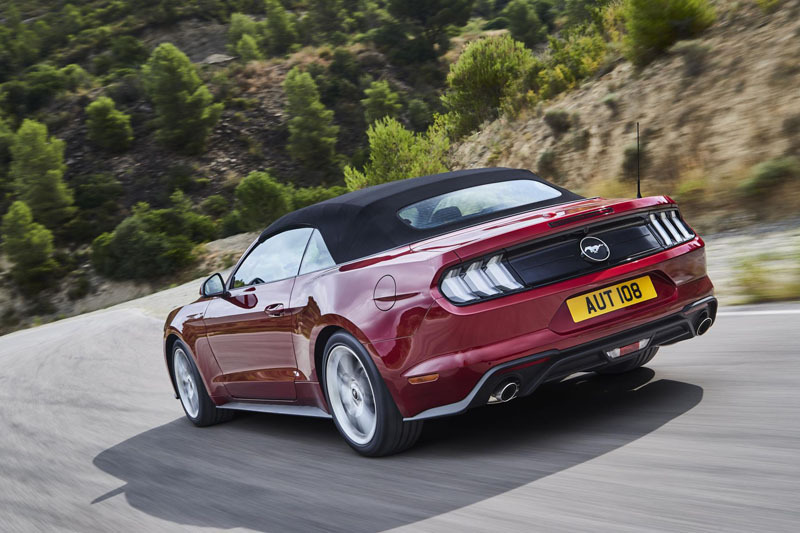 Launch Control continues to be available, while Line Lock is now offered on the 2.3 as well as the 5.0-litre engine. Keeping all of this in check are revised dampers, stiffened rear suspension joints and thicker anti-roll bars. An optional MagneRide system allows the chassis to respond to constantly changing conditions by monitoring sensors a thousand times a second. In addition to the previous Normal, Sport, Track and Snow/Wet modes, two new driving modes have been added: Drag Strip optimises the various systems for standing starts and quarter-mile performance, while My Mode allows drivers to create their own mix of settings. 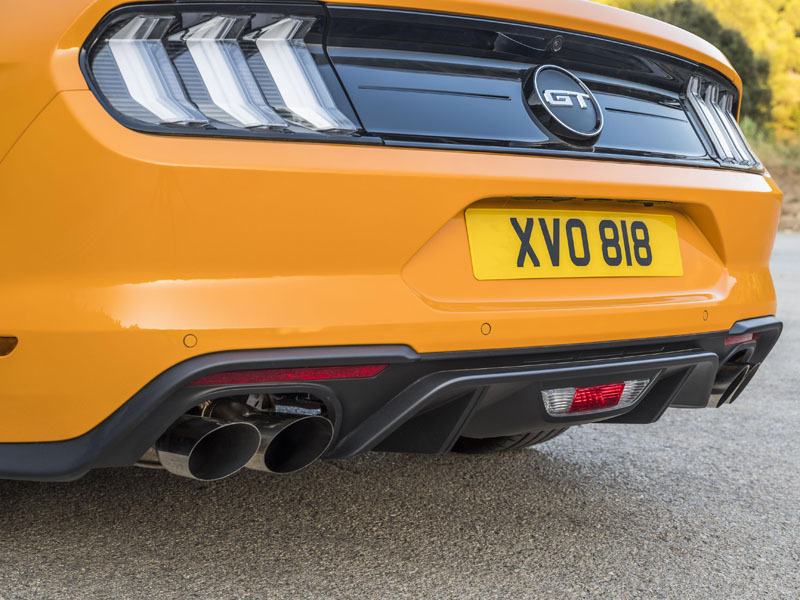 Drivers can even alter the intensity of the exhaust note, including a Good Neighbour mode that limits the sound output during certain times of the day. 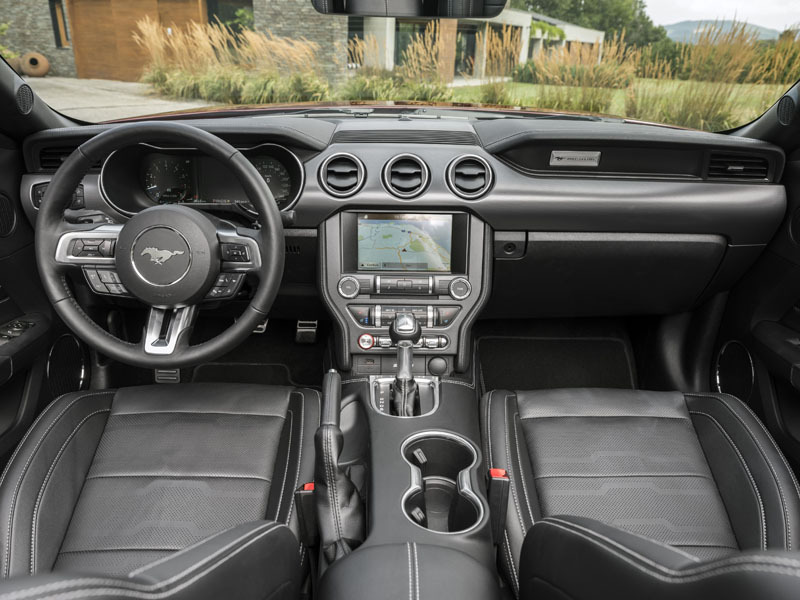 Answering recent criticism of the Mustang’s safety performance, the new model will be equipped with Pre-Collision Assist with Pedestrian Detection, Lane Departure Warning, Lane Keeping Aid, Distance Alert, and Adaptive Cruise Control. Customer deliveries of the new Ford Mustang are expected to begin in 2018. Prices will be confirmed nearer the time.